One only needs to look around the grounds at the end of the season to see the devastating effect that relegation can have on a club, their players, and more importantly, their fans. For many, relegation would rank as one of their darkest moments – it is almost treated with the same grief as a death in the family. In Argentina, they have a curious style of determining the teams that get relegated from the top division. It is decided on an average points system, where the total number of points that a team has acquired over the past three seasons is averaged out. The teams are then ranked in order of these average points, and the bottom three are relegated. If a team has not been in the division for three years, then their points total is simply divided by the number of seasons that they have been in the division. While this system is generally perceived to be a mechanism to protect the big teams if they have one particularly bad season, it would be an interesting test to see what impact this might have had on the Premiership since its inception. Would former top division regulars such as Leeds, Newcastle, Sheffield Wednesday and Southampton have been saved by this new system? Would we have seen the same teams relegated, or have certain teams benefitted from the occasional strong season to boost their average? Hull City were unable to turn their poor form from the previous season around, and they were joined by Burnley and Portsmouth, who had suffered major financial problems, going into administration in February. However, recent good performances would have saved Portsmouth, even with the points deduction, seeing Wolves joining Hull and Burnley in the Championship. If investors knew that Portsmouth would be remaining in the Premiership, might somebody have moved in already to save the struggling club? The demise of Newcastle United was the major story of the 2008/09 season. Major infighting, constant managerial changes and a lack of real quality saw the famous club suffer the ignominy of relegation to the Championship. They were joined by north-east rivals Middlesbrough and West Brom. Intriguingly, under the alternative system, both Newcastle and Middlesbrough would have stayed in the Premiership, and their bitter north-east rivals, Sunderland, would have taken their place in the Championship, along with recently promoted Hull City. Reading suffered severe second season syndrome, having just missed out on a UEFA Cup place in their first season at the top level. They were joined by Birmingham and the woeful Derby County side, who secured the lowest ever total of points in the top division. Reading’s previous heroics would have been enough to save them, and would have seen Sunderland drop down into the Championship instead. Maybe Reading would have been able to hang on to some of their young stars, and Sunderland may have parted ways with Roy Keane and would almost certainly not have signed the likes of Kieran Richardson, Kenwyne Jones and Craig Gordon. This season saw Sheffield United relegated, following West Ham’s dramatic late recovery, led by the ineligible Carlos Tevez. The matter would eventually go to the courts, where Sheffield United were awarded compensation, but this mattered little to them at that stage. Charlton and Watford joined them in the Championship. Under the Argentinean system, the whole Carlos Tevez affair would have been less relevant, since Sheffield United would have been relegated anyway. Even if West Ham had gained less points, Charlton had a higher average than Sheffield United, so would have stayed up instead. Birmingham City joined West Brom and Sunderland in losing their Premiership place in this season. Portsmouth had looked likely to go down, but a miraculous escape, masterminded by the returning Harry Redknapp saved them. Portsmouth would not have been so lucky under the average points system. Even their dramatic late recovery would not have been enough, and they would have gone down in place of Birmingham. Considering they went on to solidify their position in the top flight, winning the FA Cup only two years later, and suffering crippling debt as a result, would things have been different had they gone down this season? Southampton were the major casualties in the 2004/05 season. They had been in the top flight since 1978, famously pulling off a number of great escapes over the years. However, they finally succumbed to relegation by two points. They were joined by Crystal Palace and Norwich. West Brom were the lucky team to survive. They would have gone down at the expense of Southampton had the Argentinean system been in place. 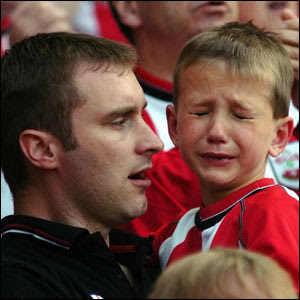 Southampton suffered major financial difficulties as a result of relegation, dropping all the way to League 1, experiencing numerous points deductions en-route. 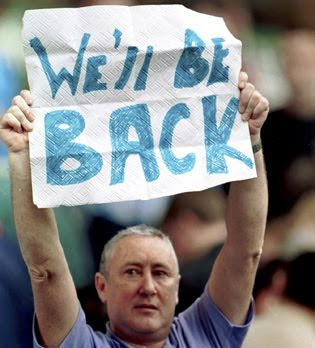 Leicester and Wolves were both relegated in 2004, but their demise was overshadowed by the relegation of Leeds United. Only three years before, they had been playing in the Champions League, but missing out on 4th spot in the 2001/02 season had led to the onset of major financial problems, leading to the departure of a number of major players. They would have been saved by the alternative system, although whether they would have survived much longer in the Premiership is another question. However, their subsequent financial demise may not have been as dramatic as it turned out to be. Interestingly, Portsmouth would have been the unlucky team to replace them, despite finishing 13th in their first season in the top flight. West Ham were deemed to be too good to go down, but this was not the case. A poor season led to their relegation from the Premiership, where they were joined by West Brom and Sunderland. The Hammers would have comfortably retained their place in the top flight following their 7th placed finish the previous season. Bolton would once again have been the team to take their place in the lower divisions. Following their relegation, the likes of Joe Cole, Michael Carrick, Glen Johnson and Jermain Defoe all departed the club. They may have re-established themselves as a solid Premiership club at the expense of others had they been able to stay in the top flight. This season saw UEFA Cup participants, Ipswich Town, suffering a major case of second season syndrome, collapsing to a poor 18th placed finish. They were joined by long-term top division sides Derby County and Leicester City. Under the average points system, Ipswich’s solid showing the previous season would have been enough to save them, whilst newly-promoted Bolton Wanderers would have taken their place. Considering Bolton went on to solidify their Premiership status, even qualifying for the UEFA Cup, how different things might have been for Bolton and Sam Allardyce had the side not remained in the Premiership in 2002. Manchester City, Coventry and Bradford suffered relegation in this season. Having flirted with relegation the previous season, Bradford simply did not have the quality to survive in the division. Coventry City had been a fixture in the Premiership since its inception, but this season saw the culmination of a long decline in their performances. All three sides would have been relegated under the alternative system. The turn of the millennium saw two former regulars in the top flight fall away, never to be seen again. Wimbledon and Sheffield Wednesday had been established members of the top flight in recent years, but were unable to retain their places. They were joined by Watford. The Argentinean system would not have been enough to save Wimbledon, who had been flirting with relegation for several years. However, Sheffield Wednesday would have stayed up at the expense of Bradford. Their relegation led to severe financial problems and they have recently returned to League 1 – would things have been different had they stayed in the top flight? Blackburn Rovers were the major casualty of the 1998/99 season, suffering the heartbreak of relegation only five years after being crowned champions of England. They were joined by newly-promoted Charlton and Nottingham Forest. Everton would have been the unfortunately club to drop out of the Premiership, ending their record-breaking 96 year stay in the top division of English football. Everton have since re-established themselves as one of the major forces in the Premiership, having been one of the few to break the monopoly on the Champions League, but how different might their fortunes have been had they been relegated in 1999. This was the first season of the Premiership where all three promoted clubs immediately dropped back down to the Championship. Bolton, Barnsley and Crystal Palace were all unable to make the step up to the big time. For the first time, the alternative system would have made no difference whatsoever regarding the teams that fell out of the Premiership. Sunderland, Middlesbrough and Nottingham Forest were the unlucky teams to suffer relegation in the 1996/97 season. Once again, Nottingham Forest were the shock team to go down, having comfortably finished in the top half in recent seasons. A poor start had given them little hope, and despite a late revival led by player-manager Stuart Pearce, they finished bottom. They would have survived under the average points method, being replaced by Leicester City, who would have been relegated, despite a 9th placed finish and victory in the Carling Cup. Had they been relegated, would Martin O’Neill have remained at the club or would the highly-talented Northern Irishman have moved on to a bigger job. The 1995/96 season saw Manchester City, QPR and Bolton fall out of the league. QPR had been a strong upper-half Premiership team up until this season, where the wheels really came off, after selling club record goal-scorer Les Ferdinand the previous summer. As expected, QPR’s previous strong showings would have excused them this one failing, where they would have been replaced by Middlesbrough. QPR have never returned to the top flight since, having gone through a large number of managers, and even falling down to the third tier of English football. This season saw four teams relegated as the Premiership downsized from 22 teams to 20. The unlucky four were Crystal Palace, Norwich, Ipswich and Leicester City. This had been a dramatic fall from grace for Norwich, who had finished 3rd in the inaugural season of the Premiership, and having beaten Bayern Munich in the UEFA Cup the previous year. Under the Argentinean system, their previous success would have saved Norwich City, who would have retained their place in the Premiership at the expense of Southampton. However, Southampton remained in the top flight, hanging on to star player, Matt Le Tissier, and Norwich would fall into the lower divisions and it would be almost 10 years until they returned to the promised land. This relegation led to the departure of Chris Sutton to newly-crowned champions, Blackburn Rovers. Sheffield United, Oldham, and recently promoted Swindon Town were the teams to go down in the 1993/94 season. While Oldham had been regularly flirting with relegation since their promotion three years earlier, Sheffield United had been fixtures in mid-table for the past couple of seasons. Indeed, under the other system, Sheffield United would have retained their place in the Premiership and would have been replaced by recently promoted West Ham, who actually finished comfortably in mid-table. However, their poor showing two seasons previously would have dragged their total down. Considering West Ham went on to solidify their position in the Premiership, how different their fortunes might have been had they gone down to the old Division 1? The first season of the new Premiership era saw Crystal Palace, Middlesbrough and Nottingham Forest fail to retain their places in the top division. Nottingham Forest were a big name to go down, having been a fixture of the top flight for 16 years, winning 7 trophies during that period. It was this relegation that led to the end of the legendary Brian Clough’s tenure at the club. However, had we used the Argentinean system, both Crystal Palace and Nottingham Forest would have been saved, with Southampton and Coventry joining Middlesbrough in relegation. Who knows whether Brian Clough might have stayed around longer had they stayed in the top flight? As we can see, the Premiership landscape might have been very different had they decided to adopt this alternative style of relegation. The older, more traditional clubs would have been saved, and may have gone on to re-establish their position in the top division. On the other hand, the smaller, less fashionable clubs would not have been given the opportunity to solidify their position – the likes of Bolton and Portsmouth would all have been relegated before having the opportunity to concrete their position in the division. Personally, I think it would be a terrible decision were the Premiership to adopt this system. It gives an enormous boost to the established sides, giving them the leeway to slip up occasionally. However, the newly promoted sides would have to significantly perform above average to simply stay in the division in their first season. This season is an example of this – Wolves have done magnificently to finish 8 points clear of relegation in 15th place, but would have been relegated simply due to Portsmouth, Wigan and West Ham’s previous good performances. This would simply preserve the position of the elite, although one might argue that it would boost the quality of the league in the long term.